One of the projects Tim has worked on as a CL is the development of the System for Notification and Documentation (SEND). SEND is a system for digitally recording and reviewing vital signs. It automatically calculates an Early Warning Score every time new vital signs are entered to help staff easily identify patients who need urgent intervention. 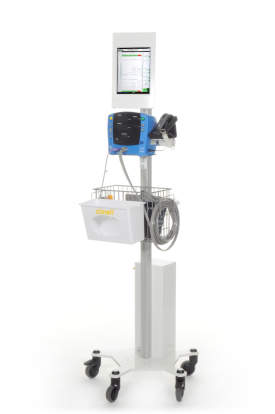 The system comprises a software application containing an Early Warning Score algorithm developed using machine learning techniques, and a customised hardware platform for fast, ergonomic data entry. SEND improves safety at multiple levels in the healthcare system. At the bedside it helps clinical staff identify abnormal vital signs and act appropriately. 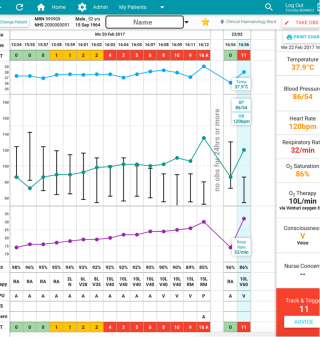 At a ward level it provides senior clinicians with a real-time overview of patient sickness. At an organisational level it provides real-time auditing of clinical practice and data for clinical governance. SEND is currently operational across all adult wards in all 4 hospitals of the Oxford University Hospitals Foundation Trust (OUHFT). It is used to record 150,000 observation sets every month. Tim and his colleagues undertook a clinical trial which demonstrated that SEND was 30% faster than charting using pen and paper. Since the start of roll-out in 2014, over 16 million vital signs have been stored in the SEND database. We are now using these data to develop next-generation Early Warning Scores and contribute to quality improvement within the Trust. Tim's role in this project was researching the user requirements, using these to design the hardware and software interfaces and project managing the development, including helping the process of licensing out the IP to a commercial partner who will help bring the benefits of our work to other hospitals nationally and internationally.